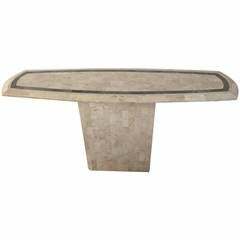 Huge Mid-Century Modern Maitland Smith tessellated stone coffee table. Made in the 1970s. 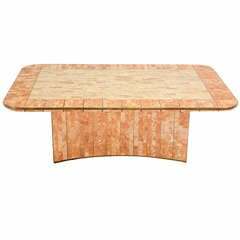 The coffee table is beautiful with two color of tessellated stone. Brown color and black color stone frame, the table are in very good condition. Dimensions: 48.5" W × 48.5" D × 16.5" H.
the table is in very good condition. 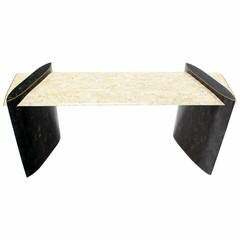 Tessellated stone veneer with brass inlays mid century modern console table by Maitland-Smith. Very nice design tessellated stone coffee table by Maitland Smith. Very nice Mid-Century Modern console table by Maitland Smith. Beautiful brass inlay. 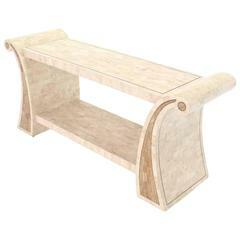 Maitland-Smith tessellated fossil/stone console table with banded inlay. 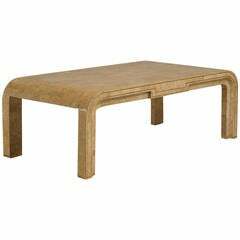 Stunning rectangular modern coffee table by Maitland-Smith made of off-white tessellated stone and having a simple carved dark brown line around the top periphery.